I am just going to go right ahead and say it, I am so tempted to elope right now! As many brides to be reading this might have realised by now, there’s a lot of pressure to ‘plan’ a wedding once you announce your engagement. Everyone expects to have received a save the date in a matter of weeks and questions start being asked if there isn’t an invite after a few months. Last year was crazy busy for us so we decided to put our wedding plans on hold and to this day we are still comfortable with that decision. However fast forward a year and I feel like I am always being asked, if we have a date yet? To the point where I think it would be easier to go ahead and elope just to stop people asking! However as those of you in the same boat will know, sometimes it isn’t just as easy as that so, for now I will have to secretly harbor my desires and continue muttering my apologies for not having made any plans yet, whilst daydreaming over intimate destination weddings like the one we are sharing with you today. Michelle and Grant choose Red Rock Canyon as their wedding destination. Coming all the way from Canada, they wanted a desert wedding full of warmth, beautiful landscapes, and fun. Red Rock Canyon weddings are perfect for couples looking to achieve beauty, privacy and adventure. “At first, I thought I wanted kitschy chapel. Isn’t that how weddings are done in Vegas?” Began Michelle. In a nutshell the vision for the day was casual, easy and fun. 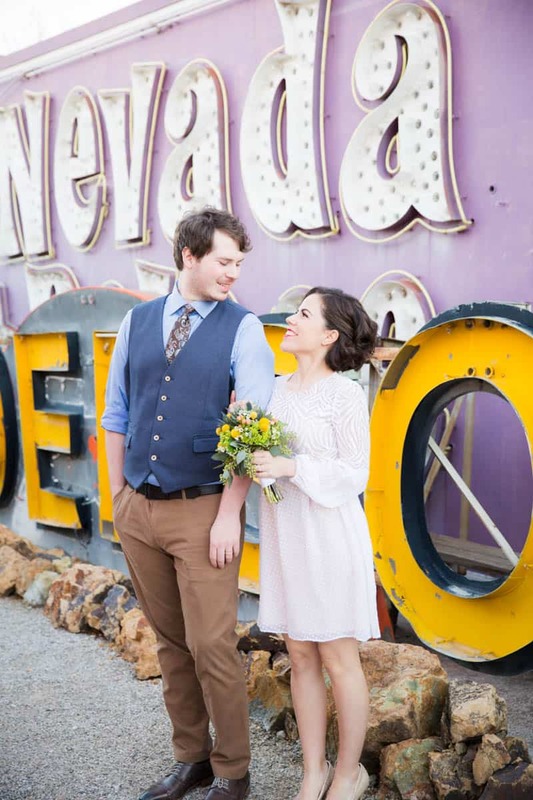 “I felt that a ceremony in the desert already gave the casual vibe as opposed to a more traditional church and banquet hall wedding.” explained Michelle. So what advice would Michelle give someone like me who is having difficulty delving into the planning process and thinking about eloping to somewhere like Vegas? Do your research and do it extensively, especially if you’re not exactly sure what you want. There is so much and even more than you think available to you in Las Vegas so take the time to learn what’s there to ensure your wedding is truly unique and perfect for you. Check out reviews on various websites – I used Google, Yelp and The Knot. If a vendor is out of your price range, ask to see if things can be tweaked to make it work especially if you love their work. Don’t cheap out on your photographer! I almost made that mistake and was going to book a ‘bargain’ photographer for $500-$600 but then realized that that was a really bad idea. I had taken all this time to find the perfect officiant, location, hair and makeup company, dress, shoes, etc, and would be spending all this money so why on earth would I risk having bad photos? Also, those photos would be the only tangible memories of my wedding day. I am so happy that I finally found McKenzi. Planning can be overwhelming especially if you’re doing it far away from the wedding location. Trust your gut feelings throughout the process because you will more than likely be right about them. Send out inquiry emails to a handful of companies you like because their responses can be quite telling. The majority of my decisions were made based on the responses I received from vendors. Have a budget but don’t get stressed out if you end up spending more than you wanted to. But, of course, be reasonable about it. Your wedding is a special day and in the grand scheme of your life, you won’t miss that money. You’ll only be left with some amazing memories.